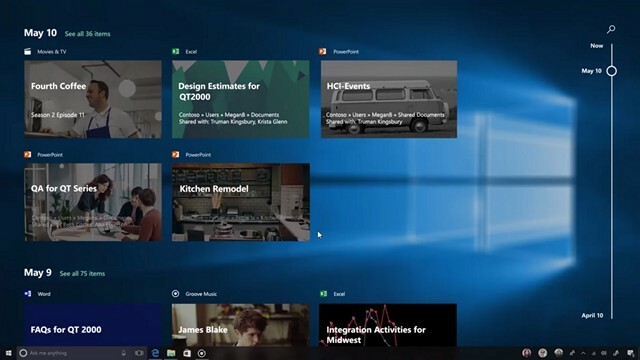 After weeks of rumors, debates, and speculations, Microsoft has finally confirmed that the much-awaited Windows Timeline feature will arrive with the upcoming Redstone 4 (Version 1803) release. This was revealed recently in the latest Windows Insider webcast by Microsoft’s Jason Howard. The feature was originally expected to be released publicly as part of the Fall Creators Update but was delayed indefinitely with Microsoft trying to iron out some of the niggling issues with the software. Meanwhile, even as Timeline is all set to hit primetime, another much-awaited feature, ‘Sets’, which was also tipped for launch with the final RS4 update, will unfortunately not be available anytime soon. However, it may end up in one of the preview builds for testing and feedback, which would be in line with what the company’s EVP, Terry Myerson, had to say through his e-mail to millions of Windows Insiders earlier this year. While ‘Windows Timeline’ enables seamless integration across Android and iOS devices thanks to its deep integration with Microsoft’s voice-based, AI-powered digital assistant, Cortana, ‘Sets’ allows users to pin different apps and websites under one window like tabs in a web browser, irrespective of whether the apps are based on the Universal Windows Platform (UWP) or are standard Win32 applications. In case you were hoping to try out Sets, the feature is expected to be released to Windows Insiders for beta testing in future Redstone builds, with the stable version probably slated to launched as part of the Redstone 5 update, but Microsoft is yet to clarify anything officially on that front. While it may take some time for third-party apps to start supporting Windows Timeline, Microsoft says that its own Edge, News, Sports, Weather, Maps and all Office apps will support the feature from day one.